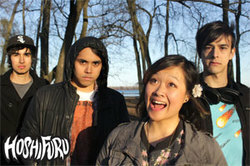 HOSHI★FURU is a rock band from the GTA, Ontario, Canada heavily influenced by Japanese pop and rock. Formed in 2008, the band's line-up consisted of vocalist Maria, guitarist Nan, bassist Roma, keyboardist Kayla, and drummer Peter. Most of the year contained little to no activity from the band apart from a performance at Northern Anime Festival in Oshawa, Ontario. Eventually, Kayla, Peter, and Roma would depart, leaving HOSHI★FURU as a duo. In 2009, the duo released their first demo entitled "First Demo CD" and then re-recruited Roma (now on guitar) and drummer Umar. As for a bassist, the band went through support members for live performances while Nan performed the duties on recordings. Notable appearances from this year include live performances at Dotcon in Mississauga, Ontario and Night It Up! in Markham, Ontario. In 2010, Roma and Umar parted ways with the band, which once again left HOSHI★FURU as a duo. The duo was only able to release one demo entitled "Sono Hibi Deshita", which featured ex-member Peter performing the guitar solo. In 2011, the duo released two demos ("Ne" and "Yorokobi Jinsei") early on in the year and then spent the rest of it inactive until November where they made a successful comeback at N2U in Ottawa, Ontario.